I’ve been continuing to work in pen and ink for #inktober and I’m pleased that I have sketched most nights this week, although I haven’t done much by way of experimentation. One of these days I hope to take out my dip pens for a change. 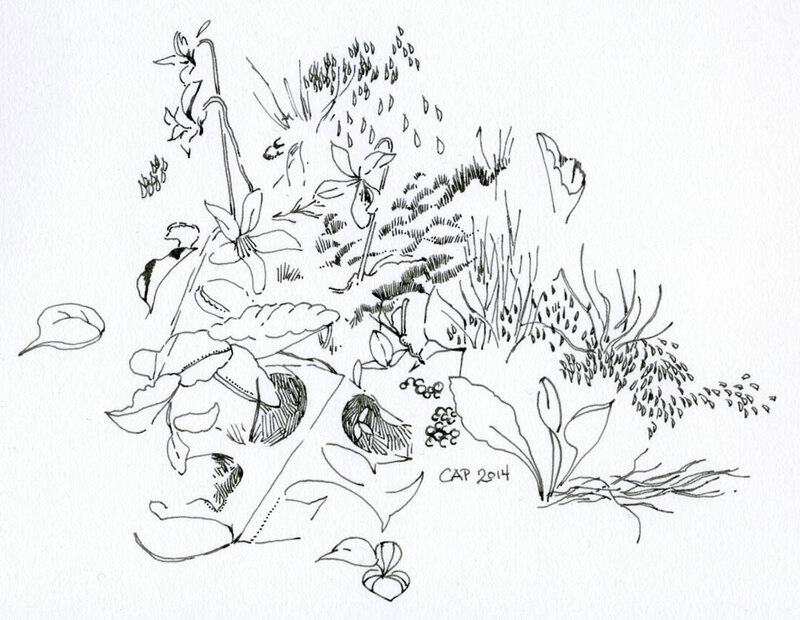 ©2014 Carolyn A Pappas, Spring Woods Sketch (10-10-2014). Ink in 8.5 x 11 gray toned sketchbook. ©2014 Carolyn A Pappas, Ocean Rock Study (10-8-14). 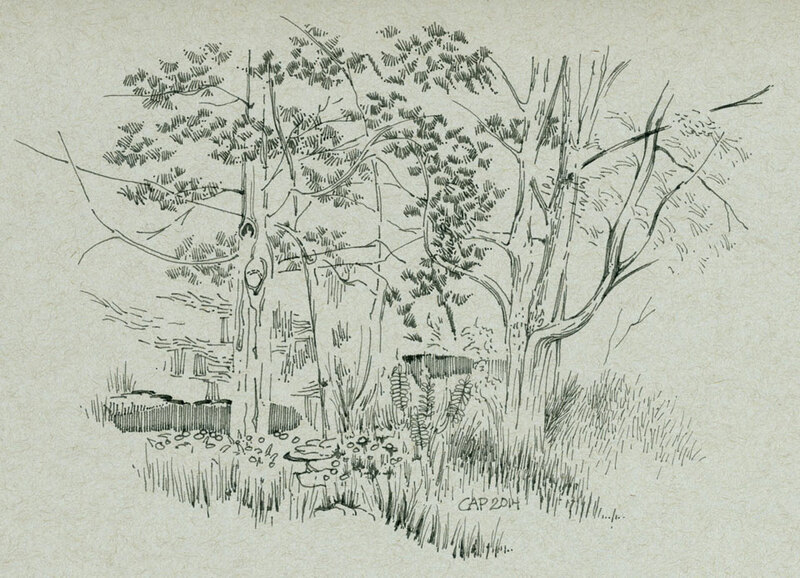 Ink in 7×10 inch Stillman & Birn Epsilon Series sketchbook. ©2014 Carolyn A Pappas, Spring Vignette (10-7-14). 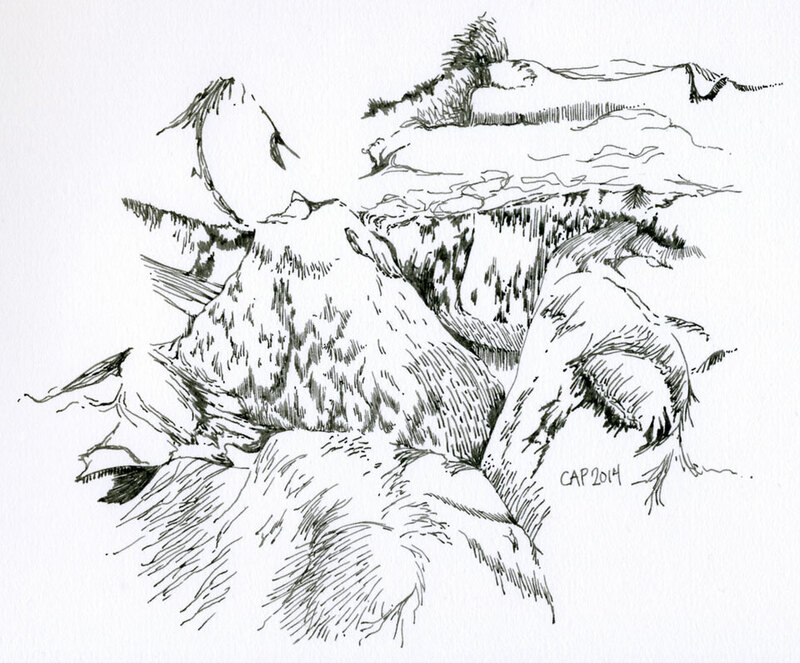 Ink in 7×10 inch Stillman & Birn Epsilon Series sketchbook. I started a painting of some rocks by the shoreline from a photo I took in Ogunquit, Maine. I have never done a painting like this before, of rocks partially covered with water. My plan is to finish up the rocks and then go in with the water at the end. It is an experiment. I had an issue with my watercolor block because the glue came off and the I had to tape my paper down to a board (after I had already started the painting). I am disappointed because this is Arches and I have never had this happen with a premium brand. I sprayed the back of the paper with water and it stayed pretty well for the most part, but the paper does have more warping than normal. 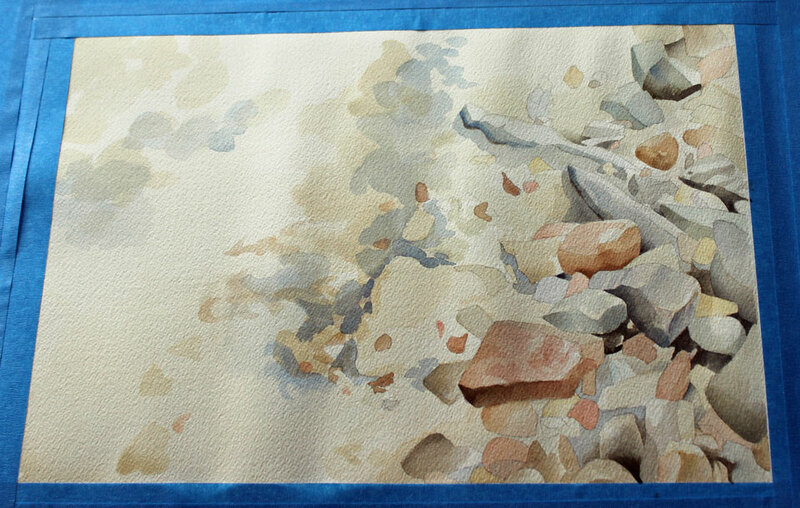 ©2014 Carolyn A Pappas, Sea Rocks (in progress). Watercolor, apx 9 x 13 inches. Newport (over the Bridge, in and out). Photographs ©2014 Carolyn A Pappas. 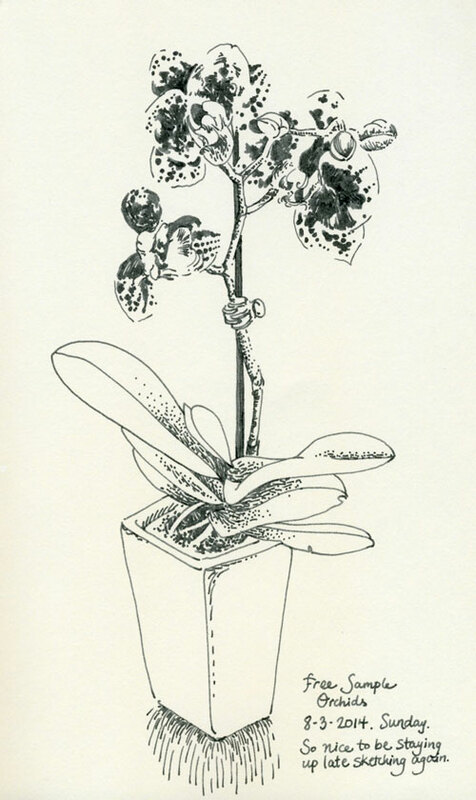 ©2014 Carolyn A Pappas, Orchid (8-3-14 sketchbook). Ink in large moleskine. I took a bus trip to Newport, RI yesterday with my sisters. I am close enough to Newport that I could go whenever I want, but I don’t go as often as I would like and it was nice to go via bus because I didn’t have to worry about driving or parking. I didn’t take very many photos but I felt like I soaked up a lot of inspiration like I always do whenever I visit. I really like the seaside/nautical atmosphere and water in general. Right now we are in a drought and the water level in the lake is very low. My energy/creativity levels have been somewhat on that same level lately but I feel that this outing yesterday refueled me creatively. The prospect of fall coming is really starting to excite me. The most exciting prospect of this upcoming fall and winter is that my space is now fully insulated and heated and I will have a comfortable place to work. 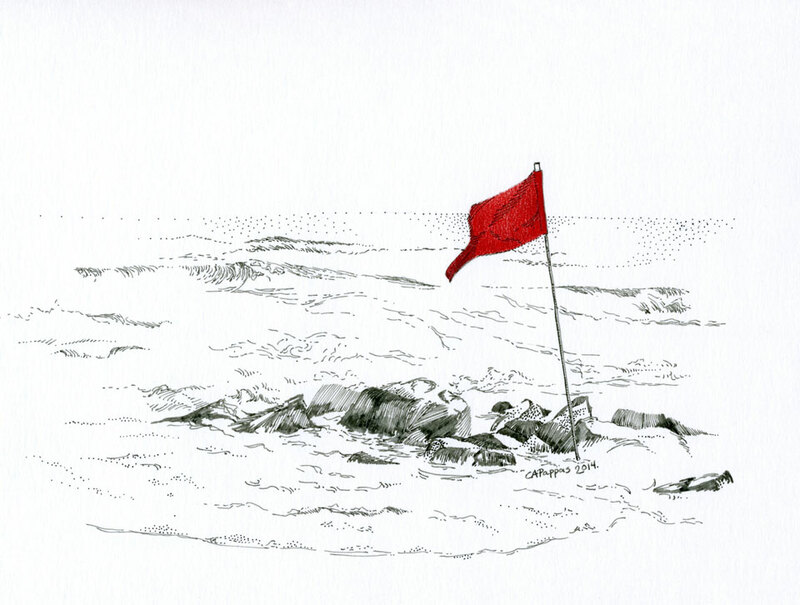 ©2014 Carolyn A Pappas, The Red Flag. Pen and ink and colored pencil, 8 x 10 inches. A red flag to warn of rocks: a memory from my trip to the Shore last summer.